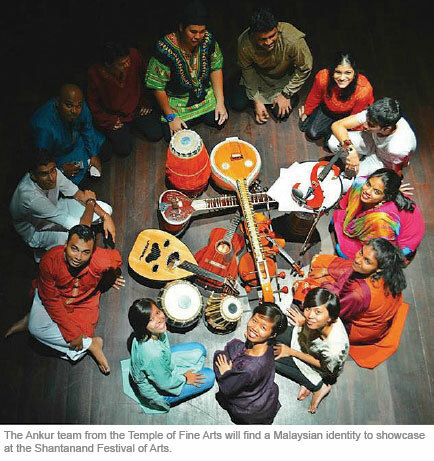 IN living up to the ideal and principle set by its late patron Swami Shantanand Saraswathi, the Temple of Fine Arts (TFA) is embarking on a six-day journey to bring Malaysians together to embrace each other, overlooking differences in religion and culture. In honour of its patron, the committee announced the Shantanand Festival of Arts (SFA) would open today at its six-storey building in Brickfields and it will feature a host of local artists, cutting across our own melting pot of culture, as well as international artists like sitar maestro Usman Khan from India and Indian violinist, composer and conductor Dr L Subramaniam. “Swamiji was all about embracing across religion, culture, art forms, dance — whether in Western, Indian or Chinese forms. And the inaugural event will attempt to depict this in a span of six days,” says festival director Kumar Karthigesu. In its 34 years of existence, the TFA has been instrumental in the development, preservation and promotion of cultures and art forms in the country having worked with various organisations, including the National Arts Culture and Heritage Academy (Aswara). The multi-disciplinary performing arts institution has churned out many productions over the years like dance dramas of the Swan Lake, Lady White Snake and A Midsummer Night’s dream, among others, under the encouragement and watchful guidance of Swamiji. The Shantanand Festival of Arts will showcase the identity of the institution through a packed schedule of music, dance and theatrical performances by TFA students and other troupes that TFA has formed a bond with, while living up to the festival’s theme of “embrace”. “Because it’s the inaugural year of the Shantanand Festival of Arts, we decided to call international artists who have been closely associated with TFA like Ustad Usman Khan, Dr L Subramaniam from Bangalore and Kathak dance exponent Pandit Birju Maharaj. “Still we wanted to limit the international artists to these three and we’re also proud to say that the response from our local artistes was very encouraging as almost everyone we approached did not turn us down,” Kumar added. The challenge for the organising committee, obviously was drawing up rehearsal schedules and the six-day programme that also includes workshop sessions in the day encompassing topics of classical Indian dance and music, contemporary dance and Western piano, and fitting everyone in seamlessly especially with the many talents involved. Performing arts groups who are not from TFA like Sutra Dance Theatre, tap dancers Rhythm Tappers, contemporary outfit Dua Dance Space, Flamenco Sin Fronteras, the Kwang Tung Dance Company, world music band AkashA, Hands Percussion and Geng Wak Long will also host workshops during the festival. The highlight of the evening shows for the festival lies in a Bollywood-style version of Shakespeare’s Taming of the Shrew. Titled Chalo Shadi Karenge, the English performance which is the brainchild of the festival’s theatre director Lam Ghooi Ket, will be staged for the first three nights of the event. “It is a good way to start as it’s fun and light-hearted, yet really does underscore the diversity that TFA is known for. “The festival is about celebrating the arts that we know with the future generation. It is to bring young people together while showing who we are. It is a good platform to showcase what we feel about the arts really,” Lam added. 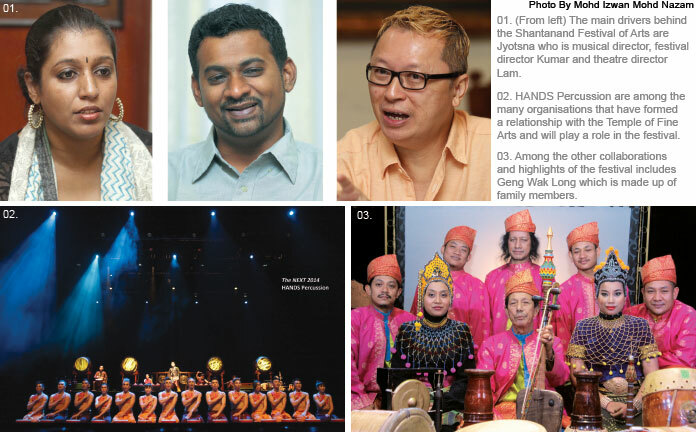 The remaining three nights of the festival will be headlined by L Subramaniam, TFA dance director Shankar Kandasamy, who will be staging a solo bharatanatyam dance show and for the grand finale, the spotlight will shine on two maestros — sitarist Usman Khan and Pandit Birju Maharaj who is an exponent at Kathak. Among the other highlights will be the Ankur orchestra who will play on the second last night under the guidance of musical director of the Shantananad Festival of Arts Jyotsna Nithyanandan, who described the festival as a stimulation of ideals. “I’m trying to include more Malaysian instruments in Ankur while looking for an identity so we’re trying to push the boundaries while questioning if I’m doing it just to represent the races rather than to address it as a Malaysian. “We have a very strong classical music section but we have also been developing the non-classical side. I may have been classically trained, but I see myself as Malaysian, not Indian — so the journey for me has been to explore modern music in a Malaysian context without sounding contrived or clichéd. That’s the theme that’s been playing in my head, that’s what I hope to achieve with Ankur team,” she adds. The non-profit organisation has managed to survive and sustain on its “pay as you wish” concept in which patrons, guests and audience to cultural shows hosted by TFA and even consumers to the Annalakshmi Vegetarian Restaurant, housed at the TFA, pay as much as they like. “It’s a formula that has worked for 34 years. I think we all have to have faith and be honest. While it does not necessarily pay the bills, and I think in doing this we have promoted the good faith of the TFA,” Kumar says. The drive behind TFA, still, is the arts and its love for it, despite the money that it collects. “Our doors are open seven days a week and our hall, when there is a performance, is packed. The TFA offers education and arts for all. We’re not after profit and we never intend to make a profit but at the end of the day somehow, the profits and losses balance out. “When TFA started out, the aim was to bring arts into every household and Swamiji always assured us that while it may not come now, it (money) will come in when you need it the most and this has stayed true,” Lam chips in. If you’re looking for a chance to contribute generously, then take advantage of the first and last night of the Shantanand Festival of Arts when Gala Dinners will be held. Patrons can book a table of 10 to 12 pax to enjoy a sumptuous spread at Annalakshmi Restaurant, and then have VIP seats for the show at the Shantanand Auditorium. Booking forms for dining tables are available at the TFA office and contributions are tax exempted. Other than to educate Malaysians and promote talent, the SFA also aims to inspire and motivate youth to a level that they would eagerly want to participate in the festival. The Shantanand Festival of the Arts will be held from today until Sunday at The Temple of Fine Arts, 116 Jalan Berhala, Brickfields, Kuala Lumpur. Admission is by pay-as-you-wish basis. Call (03) 2273 4709 for details or for more on a special gala dinner during the opening and closing at night. The full festival schedule is available on www.tfa.org.my. This article first appeared in The Edge Financial Daily, on December 2, 2014.